Major Depressive Disorder is a neuropsychiatric brain disease that is expressed in emotional, physiological and behavioral effects. It is not a sign of weakness or failure. Depression is common, chronic and severely damages quality of life, often leading to risk due to suicidal tendencies. Over 12% of the American population suffers from depression over the course of their lifetime. How much does dTMS cost? Many insurance providers now cover TMS for adults with treatment resistant depression once certain criteria are met. We will work with your insurance to determine if coverage is possible. For indications other than depression and for anyone under 18, unfortunately insurers do not cover TMS at this time. However, as the FDA approves more indications similar to what has already occurred in Europe, this will likely change. For specific co-pay amounts and out-of-pocket costs, please contact our office. How long is the treatment with dTMS? To produce maximum benefit, the typical course of treatment for depression involves one 20 minute session 5 days a week for 4-6 weeks. Since each treatment is individualized according to each patient’s needs, this may vary. 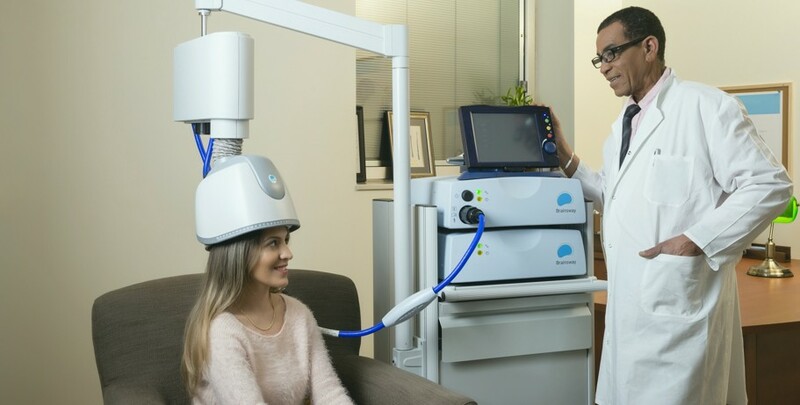 Although the full dTMS treatment course lasts 4-6 weeks, many patients begin to feel significant mood improvement within the first couple weeks. During the procedure, you will feel a light tapping of the skull. Since the magnetic current does not pass through the skin where most pain nerve endings are located, dTMS is essentially painless. What is the most common side effect of dTMS? The most common side effect reported is mild to moderate scalp discomfort during treatment. This discomfort occurred less frequently after the first week of treatment. If necessary, the discomfort can be treated with an over-the-counter pain reliever. dTMS is NOT a cure for depression. Occasionally, if individuals become overwhelmed with life stressors, depression or anxiety symptoms may return. These patients can come back for a booster dTMS. Booster treatments are typically 1 to 3 treatments to help reset their mood. Therefore, the long-term treatment plan is unique to each individual. Can I have dTMS done even if I have not tried other treatment options such as therapy and medication? Yes. If you simply do not wish to take medication nor have the time to undergo psychotherapy, you may want to try dTMS before trying other treatment options. We recommend you contact our office for a dTMS consultation to determine if this dTMS is right for you. How can I get dTMS? The first step is to contact our office for a dTMS consultation by our psychiatrist, Dr. Bryant. Dr. Bryant will review your history and discuss the risks, benefits and alternatives dTMS therapy specific to you. He will oversee the course of treatment and although will not be in the room for every treatment session, Dr. Bryant will be available to speak with you should any questions or concerns arise.